Storage: Lotions, Perfumes, & Products... Oh My! Well, Etta... I feel your disorganization pain. When I lived at home with my mom and two sisters, we also had an obscene number of lotions, perfumes, and other random products. We just can't resist our Bath & Body Works and Victoria's Secret fragrances. ;) Over years, we've organized them in different ways. The stuff we love most gets left out on the dresser tops, while the less-used products get stowed away in closets and cabinets. First, sort through everything. If there's anything at all you can possibly part with, toss it. (From one packrat to another, I know this is a challenge.) Now divide and conquer. Devise a system that works for you. Put all the lotions together, all the perfumes together, like with like. Or sort by season, which works for me. Certain heavier vanilla, amber, and pumpkin scents I only use in the cooler months... so I don't need them handy during the spring and summer like I do my floral and fruity fragrances. These stores are always teeming with cheap baskets. Load up on a bunch in different sizes and colors. Spray paint them all in a fun color and use them to store your products. Larger baskets can keep stuff at bay under your bathroom sink. Smaller baskets can keep your favorite items within reach on a shelf or dresser top. At these thrifty shops, keep an eye out for the unique. A vintage spice rack hung on the wall of your bathroom is ideal for nail polish, perfume bottles, and other small scale products. An old wooden soda crate (I see these all the time!) can organize shampoo, conditioner, hair products, lotions, etc. The right sized and shaped wine rack can also store larger bottles. Places like Hobby Lobby and Michael's are also organization goldmines. Hit up their wire and metal decor aisles for interesting solutions. A tiered wire stand can keep your favorite products organized on top of the bathroom sink or dresser top in a way that looks pretty and goes vertical with valuable space. Small trays are perfect for collecting perfumes and nail polishes. 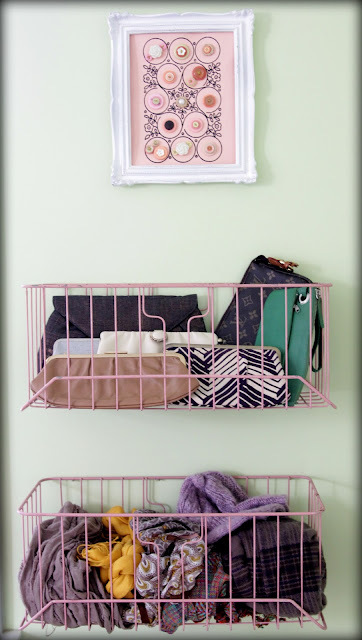 And wire baskets (left metallic or spray painted in a fun color) are an easy way to stash products in a closet or cabinet. Skip the storage aisle and head for the kitchen and office sections instead. In the kitchen area, hunt down tiered stands, cake stands, and other items that can be re-purposed to store bottles. The office section may have great totes, organizers, and bins to use instead of boring plastic boxes. Label your bins to keep clutter under control. Screw wire baskets to the wall to keep your most-used products within easy reach. Ingenious use of an over-the-door shoe organizer. Use a desktop organizer to store products you use every day. Tiered storage is sooo pretty for lotions and perfumes. I hope this inspires and helps you, Etta! I agree. Finding stylish storage is always a challenge. That tiered storage is definitely a Goodwill-type find. I'll be sure to keep my eyes peeled for something like that!